The UK has recently experienced some of the wettest months in history, with December 2015 being described as the ‘wettest calendar month’ since 1910, according to a Met Office report. Such severe weather has wreaked havoc in communities across the country, with rising waters and high winds swamping fields and endangering horses put out to graze. 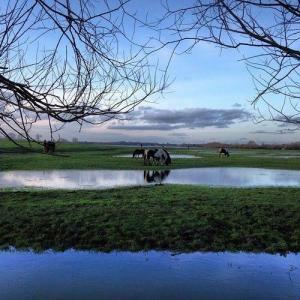 For horse owners, the aftermath of these floods has been poached, water-logged paddocks and sodden horses with reduced land to graze. Coping with the devastation has presented a huge challenge for those badly affected, but fortunately solutions for managing the deluge do exist, and we are keen to discuss them. - Saturated fields are a nightmare for horse owners as grazing is severely depleted. They are also a breeding ground for bacteria which can cause skin irritation and infections. To ensure your horse is getting the roughage he needs, liberally distribute hay around the field to replace the grass that's been lost. This serves two purposes - not only does the hay provide additional nutrients to your horse's diet, it gives him somewhere to stand that isn't two inches deep in mud and water. Your life will also be made easier as you come and go from the fields with somewhere solid to tread on. - As the rainwater begins to disappear, have a scout round for debris that's been left behind. If an area is particularly flooded and you're uncertain about what's lurking there, consider fencing it off for your horses' safety. This also goes for poached ground to reduce further damage to the pasture. If you can, move your horse to higher ground away from the flooding and the churned mud. - Give your recovering pasture a helping hand by overseeding. This involves planting grass seed into existing turf, focusing on bald patches and around gateways, which promotes thicker growth and the general condition of the turf, and makes it more resilient to diseases and insects. In short, overseeding 'spruces up' the field and helps it recover from the trauma of flooding. To do this, you'll need to prepare the ground appropriately, so you may need to ask the advice of your local agricultural merchant. - If your pastures are particularly water-logged, consider introducing a nutrient supplement into your horse's diet. Leaching causes nutrient loss from the grass, which means your horse won't be getting sufficient vitamins and minerals from the pasture alone. This could cause problems so it's important to get them in your horse's system another way. - Think about preparing for future floods and organise an emergency kit which you can access quickly. This might include a headcollar to lead your horse to higher ground, supplies of feed and supplements, wound creams and dressings, hoof ointments and bandages, a clean towel, a bright torch, and anything else you would find useful in an emergency situation.